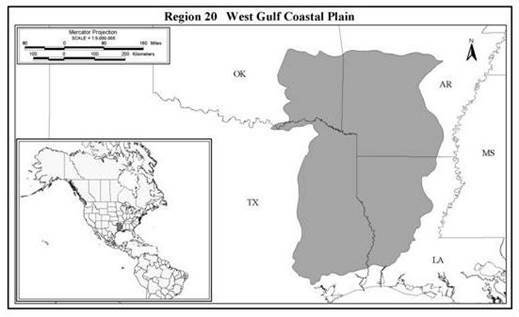 On April 17-19, 2015, Stephen F. Austin State University will host the sixth Big Thicket and West Gulf Coastal Plain Science Conference. The focus of this year’s plenary session will be “Watersheds and Waterflow” to be addressed by invited speakers. Dr. Francis “Ab” Abernethy, professor emeritus of English at Stephen F. Austin State University and editor emeritus of the Texas Folklore Society, and Dr. Kirk O. Winemiller, Regents Professor, Department of Wildlife and Fisheries Sciences, Texas A&M University have agreed to give plenary presentations. The Science Conference provides a forum for scientists and resource managers to share their research in the West Gulf Coastal Plain ecosystem, which comprises a variety of communities including southeastern pine forests, bottomland hardwood forests, and prairies. All topics relevant to the ecology of the region are appropriate, including studies of plant communities, wildlife, restoration ecology, effects of climate change, invasive species, fisheries, and large-scale disturbance ecology. In addition to the general call for papers, symposia or special sessions may be planned and available on a variety of topics. Contact the Program Committee [email protected] if you are interested in hosting a session. Presenters are encouraged to submit manuscripts to be published in a special issue of the peer-reviewed journal, Southeastern Naturalist. All manuscripts will be subject to the full peer-review process and the standards of the Southeastern Naturalist. Abstracts for papers can be submitted to Dr. Chris Comer [email protected] by 1 March. Registration fees are $100 by 20 March; late registration is $150 and student registration is $25. Registration for only one day is $60. Optional field trips are not included in fees. Three trips are planned: 1) Saline Prairie, led by Will Godwin and Jason Singhurst; 2) Tonkawa Sand Hills, led by James Van Kley, and 3) Birding in the SFA Experimental Forest, led by Cliff Shackelford. Sponsors of the event include the Big Thicket Association, Stephen F. Austin State University, USFS Southern Research Station, Texas Parks and Wildlife Department, and the Big Thicket National Preserve. Please contact Dan Saenz of the U.S. Forest Service (Conference Chair) with questions at [email protected] or check the conference website at www.bigthicket.org for additional information.